I love pom poms, so I had to incorporate them into the 13 Days project in some way, and I’m really happy with how this little pom pom topiary turned out. These are small enough that you could use them as favors / place setting cards, too. Just put your guests’ names on a paper flag instead of the number. And, if you’re concerned about glitter getting onto dinner plates or the table, you could either paint the base instead, or put a piece of paper (punched in a circle or some other shape) underneath it to keep the glitter “contained”. 1. Add a small ball of clay or a piece of a packing peanut (anything that will hold a toothpick in place) into the wood candle cup. Place a small amount of glue on a paper plate or piece of paper. 2. Paint the exterior of the candle cup with the glue, working as quickly as possible before the glue begins to dry. There’s no need to paint the bottom of the candle cup since it won’t be showing. 3. Cover the entire candle cup in microfine glitter and tap off the excess. You may notice spots where you can still see the wood. Touch up these areas by repainting with the glue and re-glittering. Set aside until the glue has completely dried. 4. 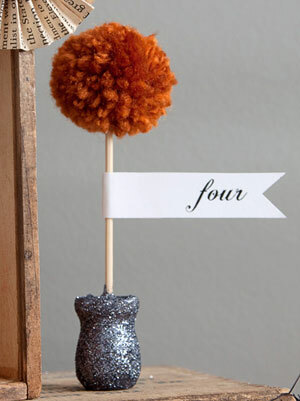 Using hot glue, attach a small pom pom (1″ to 1 1/2″ diameter) to a large toothpick or a skewer that’s been cut to size. Push the opposite end of the toothpick into the clay/piece of packing peanut that you placed into the candle cup earlier, centering the toothpick as well as possible. 5. Add hot glue to the interior of the candle cup until the glue has filled the cup. Immediately sprinkle with additional glitter, and hold the toothpick in place until the glue begins to cool and solidify. This may take several minutes. 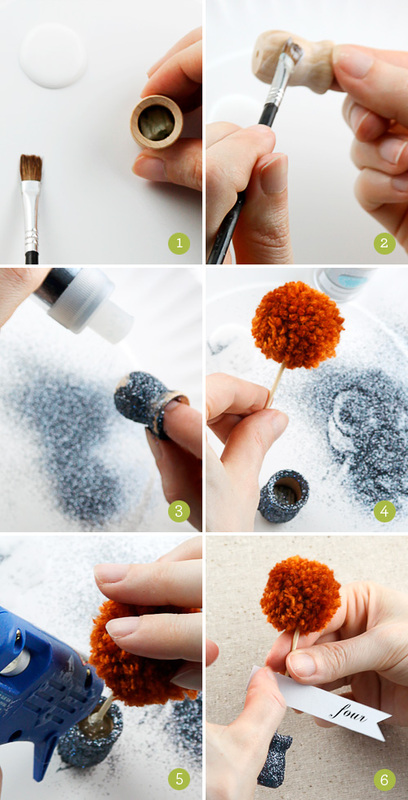 After the glue has cooled, tap off any excess glitter. 6. Use a glue stick or small glue dots to attach the calendar number to the toothpick. So so chic!! This would look so great as name tags in a place setting! I’ve added this to my roundup today. Thanks for sharing!